Operationally stable. Portfolio occupancy remained unchanged QoQ at 93.1%. There were no lease expiries in 4Q 2018. Portfolio weighted average lease expiry (WALE) of 8.3 years (by net leasable area) is the longest among industrial S-REITs (sector median: 3.6 years, as at Sept. 2018). Stable and predictable cash flow due to limited renewal risk until 2020 and hedging of foreign-sourced distributions. Only 2.7% and 4.7% of leased area are up for renewal in 2019 and 2020 respectively. The Manager did not specify which assets these expiries are coming from, other than being from the co-location assets. Foreign-sourced distributions have been hedged till 1H 2020, thus giving visibility to foreign income. 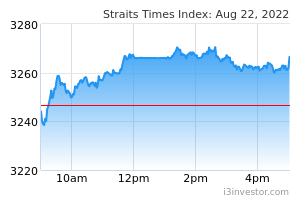 S$32.6mn revaluation gain. The Manager commented that the capitalisation rate for the portfolio remained largely unchanged. The revaluation gain was mainly due to slightly higher income assumption. The revaluation gain is only <2% of AUM. Low aggregate leverage of 30.8% and limited interest rate exposure. We estimate debt headroom of S$320mn (assuming 40% target gearing), which can be used to grow the existing AUM of S$2bn by 16%. 86% of debt has been hedged on fixed-rate. Basis Bay Data Centre in Cyberjaya remains under-utilised. Occupancy has been at 63.1% for seven consecutive quarters (originally 100%). The Manager commented that response for the property has been quite weak and has also been affected by fresh political uncertainty. The outlook is positive. Data centre demand remains robust, underpinned by increasing cloud adoption, rapid digital transformation, data centre outsourcing and data sovereignty regulations. The Manager achieved the S$2bn AUM target set for 2018 but does not have a new target for 2019. The Manager articulated that it intends to maintain the pace of acquisitions. However, we think the pace could be hampered by tightening capitalisation rates. The Manager commented on the difficulty in finding assets to buy with a limited deal flow, as owners are holding on and not willing to sell. The asking capitalisation rate for those prepared to sell are very tight. 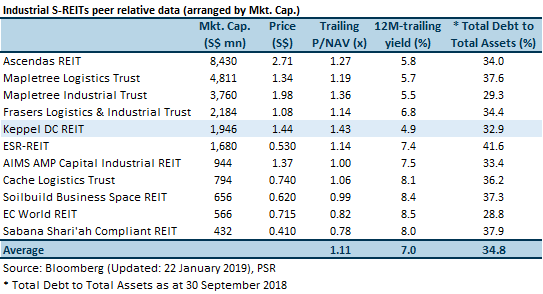 While the long-term demand drivers for data centre remains intact, downside risk may arise from the rich valuation with the implied 1.37 times FY19e P/NAV multiple. 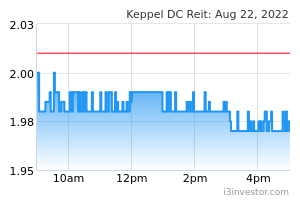 KDCREIT trades at a higher P/NAV multiple compared to other listed S-REITs. We believe this is a reflection of the burgeoning demand for the unique asset class of data centres.